Back in September, Ride Velo visited the NEC Cycle Show where there were racks of gorgeous bikes on display. But what surprised us were the huge numbers of admirers gathering round one particular stand for a bike brand we’d never heard of before: The Light Blue. Alongside the carbon Colnagos, Cervelos, Cannondales and Canyons was a retro selection of steel framed bikes – the likes of which we hadn’t seen for 30 years or so. And they, not the pro team bikes, were the ones pulling the crowds. At the front of the display was a fixed gear bike dating from 1900 – as graceful today as it was over 100 years before. This “Light Blue” bike had belonged to John Albert Townsend who rode it around Cambridge to promote his bicycle shop – Townsend’s Cycleries (established in 1895). He built this bike with a 100-tooth chain ring to celebrate the turn of the Century. This historical specimen was accompanied by a brand new range of retro steel vintage bikes called The Light Blue. We were captivated, but I was also confused because, coming from Cambridge, I remembered the Townsend’s Toys and Cycles shop from my childhood in the 1970s. It was a wonderful shop for kids, but I would never have associated that with the pure class on show here. So how did this ugly duckling from the decade that style forgot metamorphosize into the elegant swan of today? 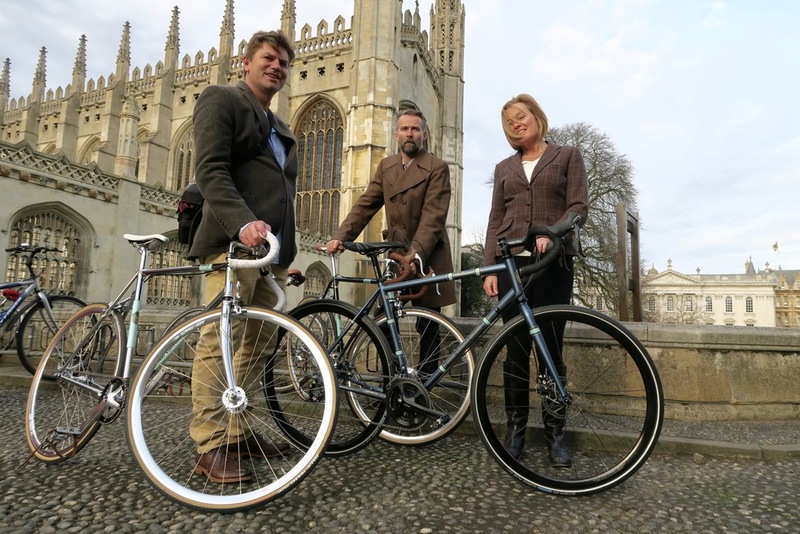 Ride Velo went back to Cambridge to meet Lloyd Townsend, great grandson of John Albert, and architect of the new brand to discover his inspiration for The Light Blue. ‘These bikes’ form part of the new ‘sport’ range designed to complement their existing ‘urban’ range of ‘sit up and beg’ style city bikes. 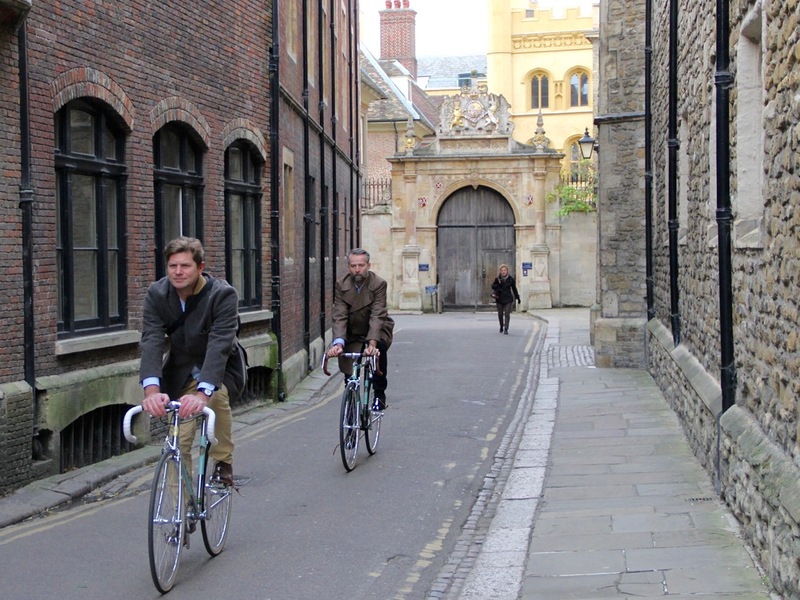 The bicycles are named after Cambridge colleges – the more traditional Trinity, St John’s, and Kings, and three new more modern models called Robinson, Wolfson and Darwin, after the later colleges. A “mixte” classic women’s version is likely to be developed soon, possibly named after St Catharine’s college, as St Catharine’s was an integral part of the soft launch of The Light Blue Sports bike concept to many of their friends when the Tour De France 2014 started stage 3 in Cambridge. 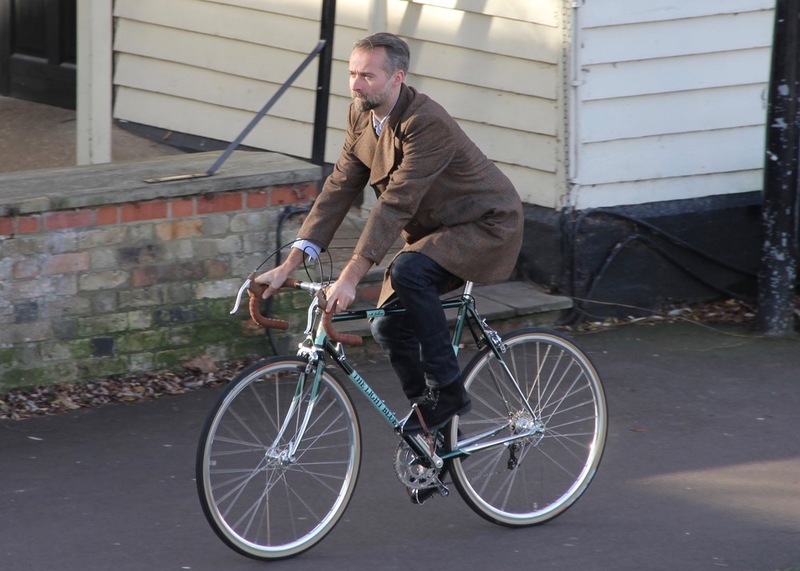 But these classy steel sports cycles aren’t completely new, as The Light Blue brand dates back to 1895 when John Albert began making hand built bikes for the wealthy members of Cambridge University. Production went on until 1920, when a shortage of manpower and materials post World War I meant that the bikes were consigned to the history books, for the last 90 years at least. Two events were pivotal in persuading Lloyd to reintroduce The Light Blue to the world. Firstly, the discovery of John Albert’s old track bike in an old corner of the warehouse. Lloyd and his father were inspired to renovate it; “I knew then, over 30 years ago, that one day in the future I wanted to revive The Light Blue brand itself.” Then in 2009, Lloyd happened to bump into the managing director of Reynold’s Technology at an airport. They chatted away in the lounge, discussing a possible partnership with a view to producing a range of high-end steel bikes. New for 2016 are the gorgeous St John’s bike, which my brother Rupert rode – a lightweight club/touring bike, and three more contemporary bikes using Reynolds tubing with a twist. Lloyd worked with Keith Noronha to deliver "ovalised top tubes and bi-ovalised downtubes which, when optimised for the forces applied in use, allow for smaller/lighter tubing to be used." Amazingly, the 853 Wolfson frame weighs in at a competitive 1.7kg, with it’s Reynolds steel tubing made here in the UK before being shipped out to Asia to be made into frames. I tested out the Robinson and found it to be astonishing light and agile, but still sturdy and robust in the gusty Cambridge winds. The Robinson also features responsive disc brakes and would be a great commuting/touring even cross bike. The frame was quite big for me, but I still really enjoyed the ride. Normally I either ride an aluminium Genesis bike for commuting or a very light carbon Merckx bike for road rides. The Robinson felt like a cross between the two – I could climb the Kent Alps on it or nip into town. But the bike that the three of us unanimously hankered after was the Darwin. It is marketed as ‘the modern evolution of touring and lifestyle bikes’ and had all the romance of a great cycle tourer. We imagined ourselves pedalling through vineyards, over cobbles or gravel, through forests, down mountains… all on a great-looking bike capable of carrying everything you need and delivering you at your destination in comfort and safety. At the end of the interview, Lloyd handed over three Light Blue cycling caps as a gift for each of us. We felt a bit emotional as he offered to lend us a St John and a Kings to ride L’Eroica festival on in June. What a lovely and very talented guy! His bikes are pretty awesome too and we’d love you to buy one – if for no other reason than to make the streets a more attractive place and give mass marketers Trek, Cannondale and the likes a run for their money.